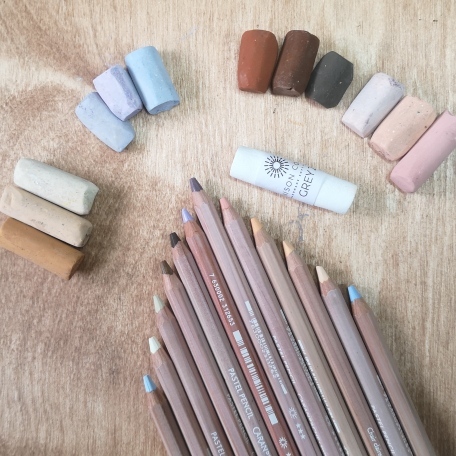 There’s no prize for guessing which pastel pencils and pastel sticks are my favourite – just looking at that delicious photo!! But, the point of this blog is not what is my favourite but which pastel pencils work best on which paper. Between myself and the lovely helpful Judy, a member of my art class in Marchwood we realised we had just about every brand of pastel pencil on the market. So we got together to do some testing. Lets find out which pastel pencils work best on which paper. The papers below from left to right (or top to bottom) are blue Ingres paper, off white Pastelmat Card and yellow Velour Paper on the end. 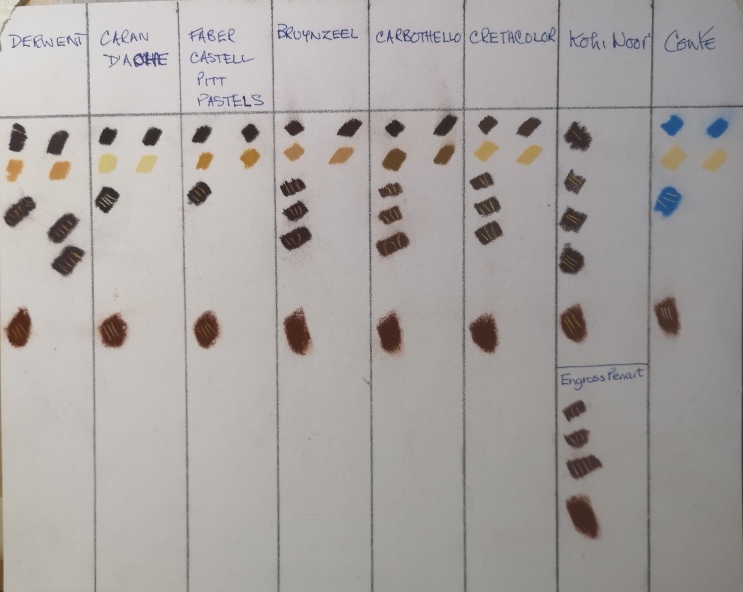 We tested the following pastel pencils as a block of colour then with a lighter colour on top and then Unison Soft Pastels with pastel pencil on top: Derwent, Caran D’Ache, Faber Castell Pitt, Bruynzeel, Carbothello, Cretacolor, Koh-i-noor, Conte and Engross Penart (very cheap pastel pencils I found on Ebay from China). Block of colour: Good coverage on Pastelmat and Ingres but pigment was paler than pastelmat. 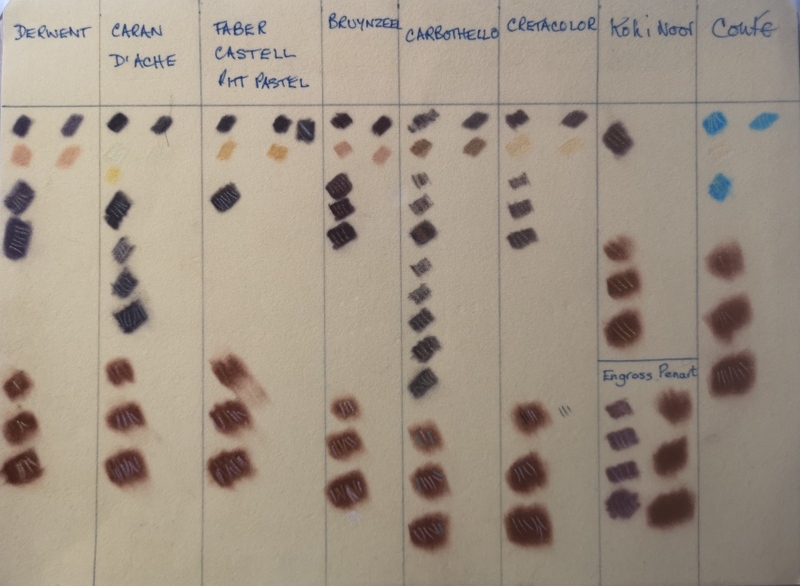 On velour poorer coverage with similar pressure and paler pigment than the Pastelmat. Pencil over the block of colour: One layer of lighter pastel pencil over the top was not very good. Pencil over Unison block of colour: better coverage than over the pencil. Unison pastels are very soft and lay more pigment down than a pencil. Block of colour: Good coverage on all 3 papers and all the same strength of colour. Pencil over the block of colour: Pencil worked well over 1 layer on the Pastelmat and paper, a couple of layers required on the Velour before it worked well. Pencil over Unison block of colour: Pencil worked well over 1 layer on the Pastelmat and paper, a couple of layers required on the Velour. Block of colour: Great on Pastelmat and Ingre, Velour was very poor. Pencil over the block of colour: Great on Pastelmat, good on Ingres and terrible on Velour. Pencil over Unison block of colour: Great on Pastelmat, good on Ingres and Velour was terrible. Pencil over Unison block of colour: Great on Pastelmat, good on Ingres and Velour was suprisingly good. Block of colour: Good coverage on Pastelmat and Velour but pigment was slightly paler on Inges paper. On velour poorer coverage with similar pressure and paler pigment than the Pastelmat. Pencil over Unison block of colour: Worked best on Pastelmat, quite poor on Velour. Pencil over the block of colour: Great on Pastelmat, not good on Ingres and terrible on Velour. Pencil over Unison block of colour: Great on Pastelmat, good on Ingres and Velour was very pale and difficult to get coverage. Pencil over the block of colour: Best on Pastelmat but not as good as others, not good on Ingres and terrible on Velour. Hmmmm Did this test answer the question – Which pastel pencils work best on which paper? This was a very straight forward simple test and as we were conducting it I was realising it’s shortfalls. I do not work with pastel pencils in this simple way. 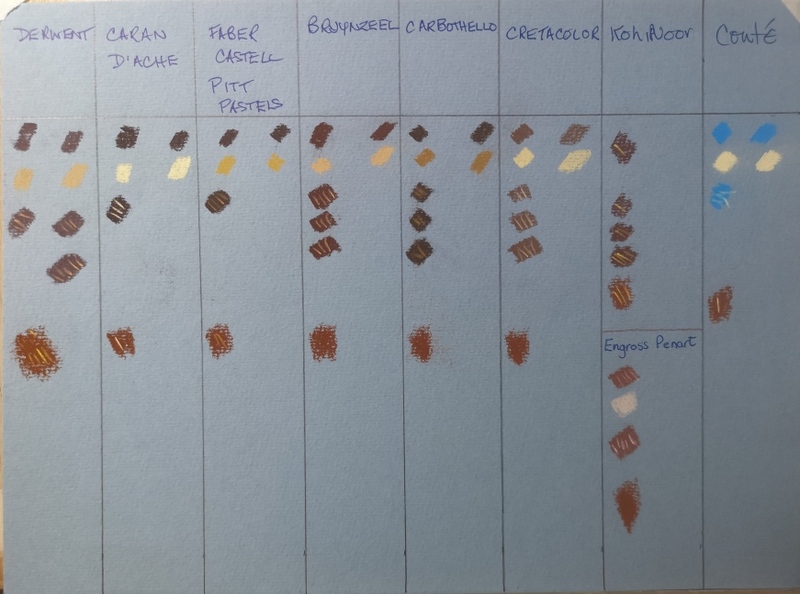 For example, the results show that Caran D’Ache is good on Pastelmat but how will it layer with multiple layers. I have found them to be problematic because they are very soft. However, Pastelmat is not my paper of choice and the one that I’ve had most experience with. With a little more practice and some lighter layers, this combination may work for me. So which paper and which pencil brand should you use together? It’s a really tough question and the only person that can answer that is you. Because despite these results there will always be artists who will disagree and in fact, i know artists that use certain pastels and pencils that I find impossible to use on Velour. It is down to technique and honing your skills. Choose 3 to 5 pencils of each brand and work out which ones suit your style best. Most artist end up with a range of brands simply because it gives them better colour choices. For example, I am finding that the Bruynzeel and Koh-i-Noor pastel pencils work great on velour but they only have 48 in the set. Whereas Caran D’ache have a range of 84 and the colour choices are delightful.